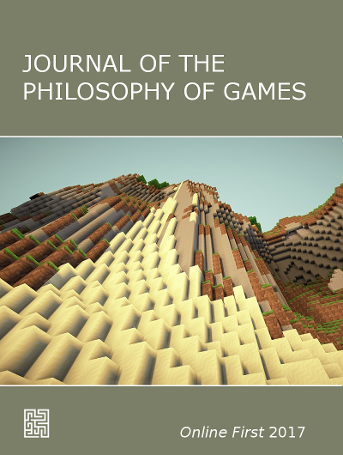 We now open Journal of the Philosophy of Games (JPG) for general submissions, and welcome philosophers, game theorists and scholars in other fields of studies to submit papers for the regular issues. JPG explores philosophical questions about the general nature of games and gameplay and about their interrelation with technology, art, communication and social interaction. More information about the submissions and the author guidelines is found at the journal website. We welcome submissions of regular articles, discussion notes and book reviews. Please contact the editorial board to ascertain that a book review will fit the journal profile. Submissions may be submitted via the submission system on the journal website, and will receive double-blind peer review from renowned scholars in philosophy and game studies. The Journal of the Philosophy of Games (JPG) is now publishing the first manuscripts in our “Online First Issue“, which will be converted into a regular issue by the end of the year. We aim to have the papers indexed in the major relevant library indexing databases. JPG is an open-access publication hosted by the University of Oslo, Norway.